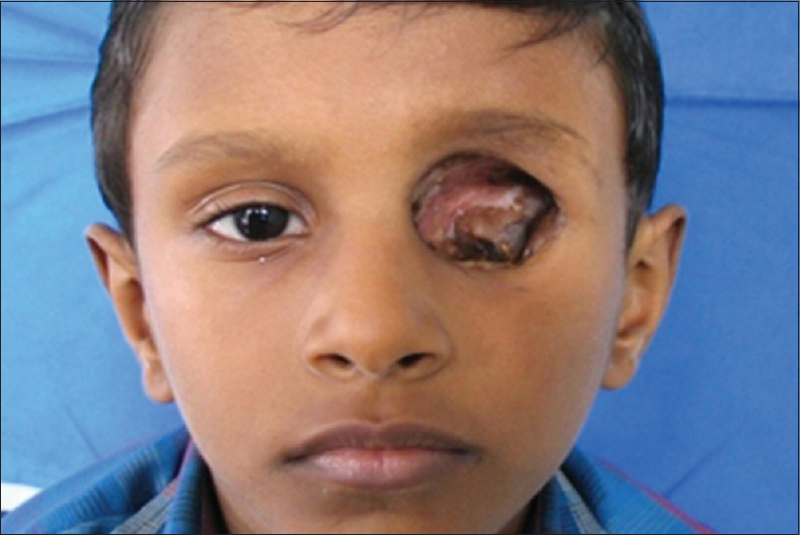 Congenital defects, severe trauma and tumor attribute to the loss of an eye, and subsequent deformity. Defects of the eye can be ocular or orbital. 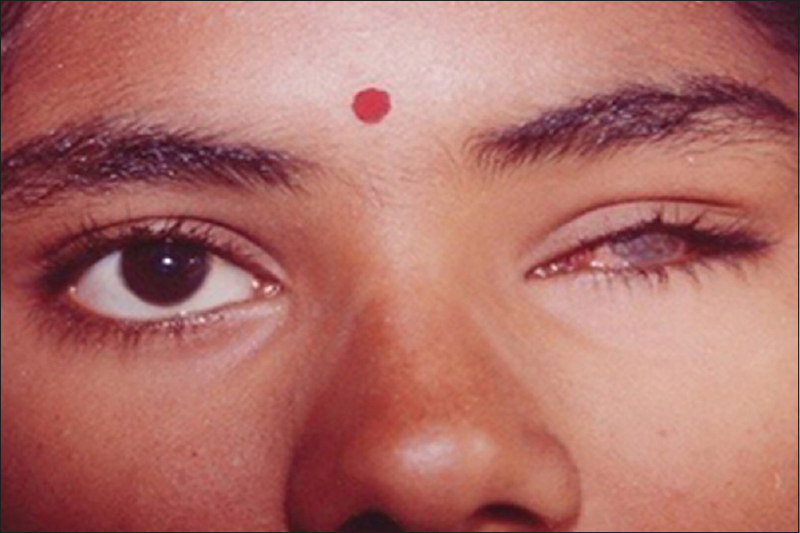 Ocular defects involve only the eyeball, whereas orbital defects include periorbital tissue. Successful rehabilitation of the defect with orbital prosthesis aims to improve the physical and emotional status of the patient thus ensuring social acceptance. This article discusses the prosthetic rehabilitation of patients with three different types of orbital defects and highlights the techniques involved in the fabrication of orbital prosthesis for each type of defect. 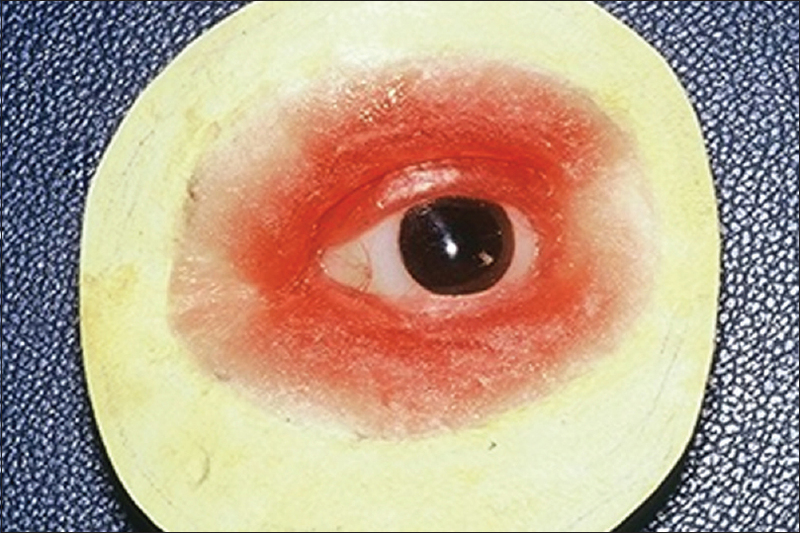 The evisceration and enucleation defects discussed in the case presentations are rehabilitated using intraocular acrylic prosthesis, whereas an extraocular silicone prosthesis retained with an adhesive was the mode of rehabilitation adopted in an exenteration defect. Management of orbital defects by proper diagnosis, treatment planning, and rehabilitation with appropriate maxillofacial prosthesis was expected to improve the function and cosmetic efficiency. An 18-year-old female patient reported to our Maxillofacial Prosthetic Clinic. She presented with a history of panophthalmitis and had undergone a minimal invasive surgery. 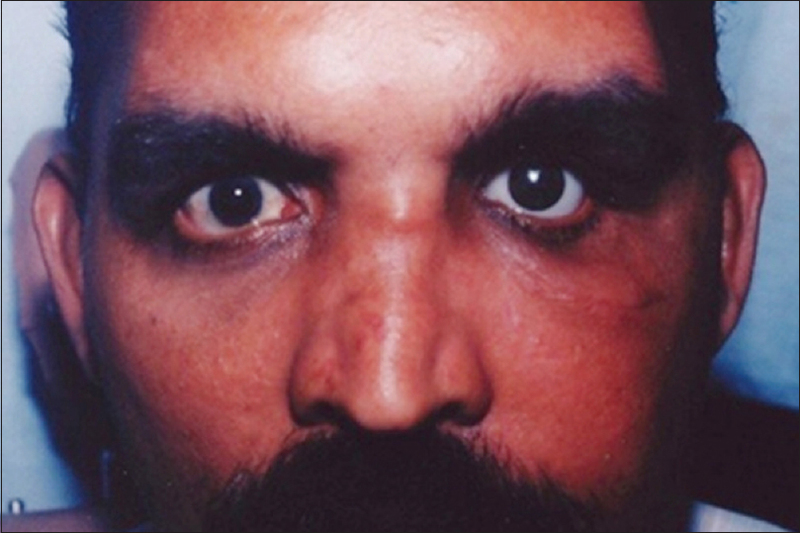 The surgical procedure involved removal of the globe contents leaving the sclera intact [Figure 1]. A prefabricated eye shell was selected that perfectly matches the contralateral eye. Selective grinding of the eye shell was performed followed by minimal acrylic relining. The intraocular prosthesis was then inserted to the socket [Figure 2]. The custom tray was fabricated and impression made with light body polyvinyl siloxane impression material (Aquasil, Dentsply) because of its accuracy in capturing surface details and dimensional stability [Figure 4]. The material was injected slowly into the socket and patient was asked to perform various eye movements to facilitate the flow of impression material into all aspects of the socket. Master cast was poured and wax pattern fabricated with the eye shell in position on the outer surface. After dewaxing heat cure acrylic packed. Prosthesis recovered after curing; finishing and polishing done to deliver it to the patient [Figure 5] and [Figure 6]. The impression of the defect is made with light viscosity polyvinyl siloxane and supported with plaster of Paris. The cast is then retained, and the wax pattern is sculpted with care. The edge of the wax pattern is made thin to merge with the remnant surrounding soft tissue [Figure 8]. Recontouring of the wax segment that represented the palpebral fissure was done to attain a smooth convex surface. 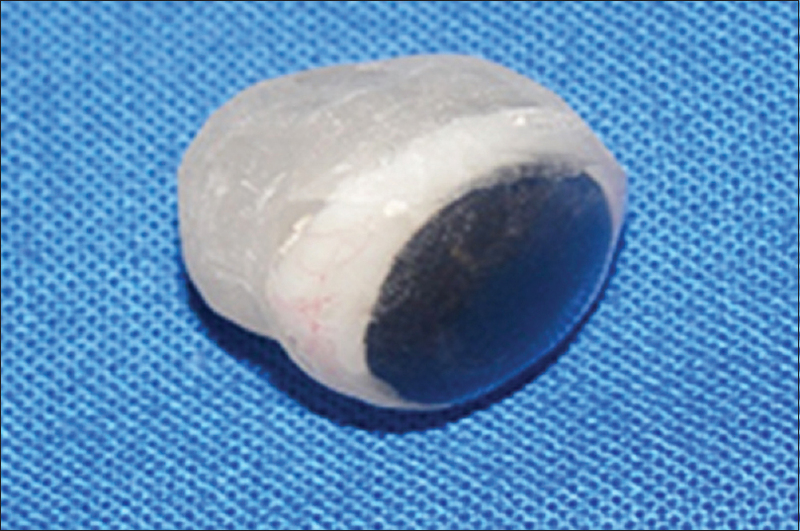 A prefabricated eye shell was selected which matched with the shade of the contralateral eye. The landmarks were determined to position the iris by making the patient look straight. During the trial, the wax pattern was placed into the patient's socket and modified as that of the contralateral eye. The wax pattern with the master cast is then invested. When the flask is opened after dewaxing procedure, the eye shell is secured firmly to a single component of the flask. Room temperature vulcanization silicone (A-2186, Factor II incorporated) was packed into the mold with intrinsic stains. After curing, recover the prosthesis followed by extrinsic staining to match the skin colour and eyelashes were attached using patient's own hair. The extraoral silicone prosthesis was delivered to the patient after finishing and polishing. The retention of prosthesis was achieved using Daro Hydro Bond adhesive (Factor II incorporated) [Figure 9]. The patients were given instructions regarding the maintenance and use of adhesives. Home care protocol includes handling the prosthesis with clean hands and cleaning using disinfectant solution. Removal of the prosthesis during night is required. Recall visits were advised every year for routine polishing of prosthesis to prevent deposition of protein and bacteria. The techniques discussed in the above-reported cases ensure that prosthetic rehabilitation restore the patient anatomy as normal as possible and helped the patient to regain the self-confidence assuring an improvement in the quality of life. The mode of retention of the prosthesis can be either by adhesives or with implants. Orbital implants provide reliable retention and improved postoperative cosmetic result by filling the orbital volume and also reducing the chance of socket contractions due to scar tissue formation. However, in cases where the bone density is less and bone growth is incomplete, adhesive retained prosthesis is the preferred option. For implant supported orbital prosthesis, magnetic attachment is the preferred mode as it requires minimum space (can be used in shallow regions), strong attractive force at placement time, simpler hygiene maintenance, and ease to locate. However, the disadvantages reported include its corrosive nature and need for encapsulation with an inert material. The present clinical works reported the surgical interventions such as evisceration, enucleation and exenteration; and prosthetic rehabilitation of such defects. For evisceration and enucleation defects, intraocular acrylic prostheses given; whereas for exenteration defect adhesive retained extraocular silicon prosthesis given. A multidisciplinary approach with proper diagnosis and treatment planning will help to improve the overall quality of life of the patient. The prime factors that need to be considered for a final outcome include surgical modifications to enhance the prosthetic rehabilitation; accurate impression of the defect should be made, selection of proper material, and technique for the fabrication of prosthesis. This helps to recover confidence and self-esteem in today's cosmetically challenging world. Ben Simon GJ, Schwarcz RM, Douglas R, Fiaschetti D, McCann JD, Goldberg RA. Orbital exenteration: One size does not fit all. Am J Ophthalmol 2005;139:11-7. Peyman GA, Sanders DR, Goldberg MF. Principles and Practice of Ophthalmology. Vol. 3. 1 st Indian ed. New Delhi: Jaypee Bros; 1987. p. 2. 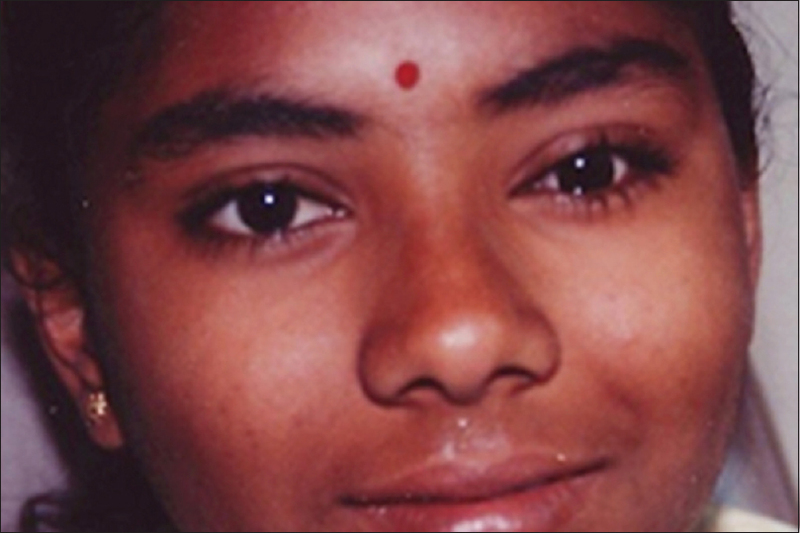 Supriya M, Ghadiali B. Prosthetic rehabilitation of a patient with an orbital defect using a simplified approach. J Indian Prosthodont Soc 2008;8:116-8. Levine MR, Fagien S. Enucleation and evisceration. In: Stewart WB, editor. Surgery of the Eyelids, Orbit and Lacrimal System. Ophthalmology Monographs. Vol. 3. American Academy of Ophthalmology; 1995. p. 8. Shore JW. Evisceration. In: Levine MR, editor. Manual of Oculoplastic Surgery. New York: Churchill Livingstone; 1988. p. 189-94. Nunnery WR, Ng JD, Hetzler KJ. "Enucleation and Evisceration." In: Spaeth G, editor. Ophthalmic Surgery: Principles and Practice. 3 rd ed. Philadelphia, PA: Elsevier; 2003. p. 485-507. Rahman I, Cook AE, Leatherbarrow B. Orbital exenteration: A 13 year Manchester experience. Br J Ophthalmol 2005;89:1335-40. 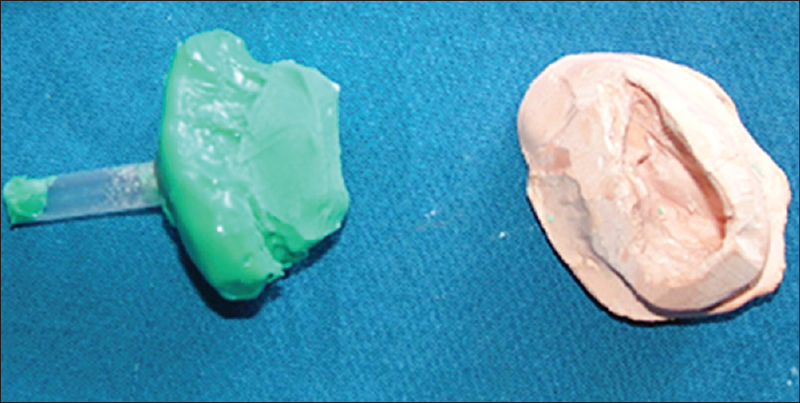 Manju V. Prosthetic rehabilitation of facial defect with silicone prosthesis. KDJ 2009;32:154-5. 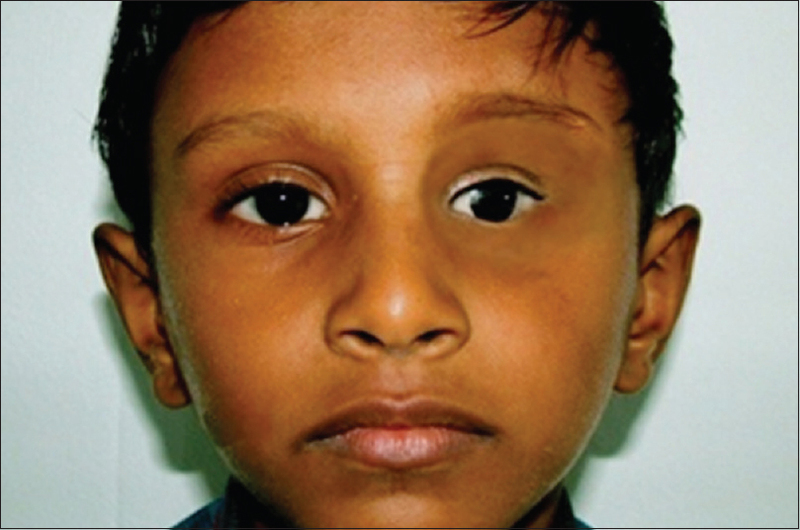 Amornvit P, Rokaya D, Shrestha B, Srithavaj T. Prosthetic rehabilitation of an ocular defect with post-enucleation socket syndrome: A case report. Saudi Dent J 2014;26:29-32. Maller US, Karthik KS, Maller SV. Maxillofacial prosthetic materials - Past and present trends. J Indian Acad Dent Spec 2010;1:25-30. Devaraju K, Gopalkrishna H, Rao S. Ocular prosthesis. 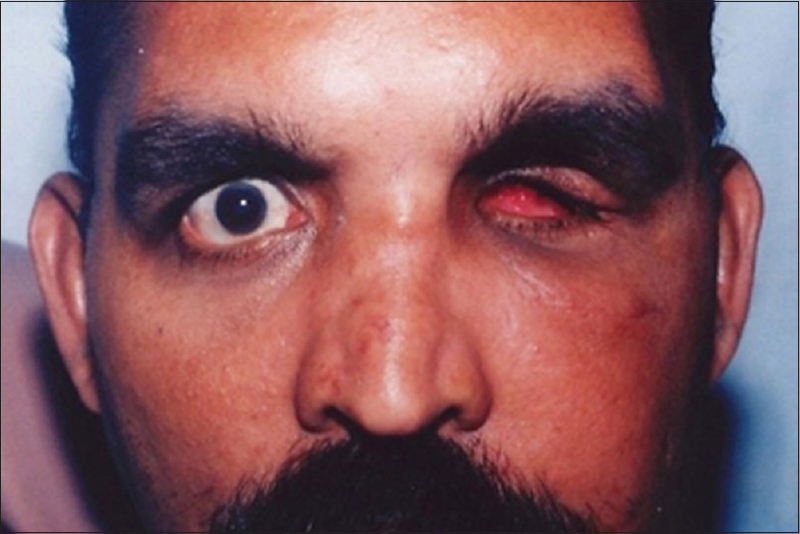 A unique method, for post evisceration ocular defect. Eur J Prosthodont 2014;2:86-8. Baino F, Perero S, Ferraris S, Miola M, Balagna C, Verné E, et al. Biomaterials for orbital implants and ocular prostheses: Overview and future prospects. Acta Biomater 2014;10:1064-87.